The city of Dover has a long history and the town’s proximity to the continent begins with Stone Age when people crossed what was a land bridge prior to opening of the English Channel. Since that time, there have been many migrations and invasions by people. The archaeological evidence which is present suggest that cross channel trade is present and the attempts of the residing individuals to build large scale defences against European invaders on this part of the English coast. During the modern times, the emphasis is on the growth of Dover as a commercial and port city where there would be ferries for both passengers and freight along with cruise ships. Dover is also known as a tourist hub where many visitors come into experience the historical significance and the natural beauty of the city. When examining into the history of Dover and the supporting archaeological evidence, in the River Dour valley, it has shown the remains and finds of the olden age Neolithic findings such as flint implements, pottery, used tools etc. This has been named one of the oldest and major early settlements of inhabitants in Kent. The early inhabitants arrived by crossing the land bridge which is the pre – English Channel. Most of these settlements occur in river valleys. When the bridge was broken, the settlers who came afterwards had to arrive by sea. The artefacts revealed the earliest evidence That Dover was becoming a place of trade with that of Ireland and the Continent. The Beaker Folk which formed the Bell- Beaker culture had widely scattered archaeological culture of prehistoric western and Central Europe, which started in the late Neolithic or Chalcolithic and running into the early Bronze Age. This culture had distinct pottery beakers which were used to hold as drinking vessels. The Bronze Age people in the later stages traded in gold and there have been findings near Dover. Further archaeological evidence is displayed in the Dover Museum which is a boat and a hoard of axes which denotes a great significance into the Dover history. The hoard of axes was discovered in the Langdon Bay, off Dover. There has been a discovery of Iron Age finds as well. 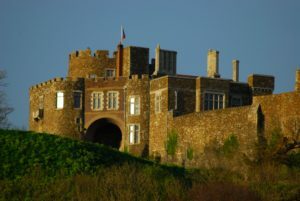 Due to erosion and the changing sea levels, it is believed that much of Dover’s Stone Age remains have been destroyed. Thus, the remains are just a handful of stone axes. The first inhabitants of the Dover’s River Dour valley were the Stone Age farmers who had crossed to Dover in a boat with corn seed and domesticated animals, which is nearly 6000 years back.